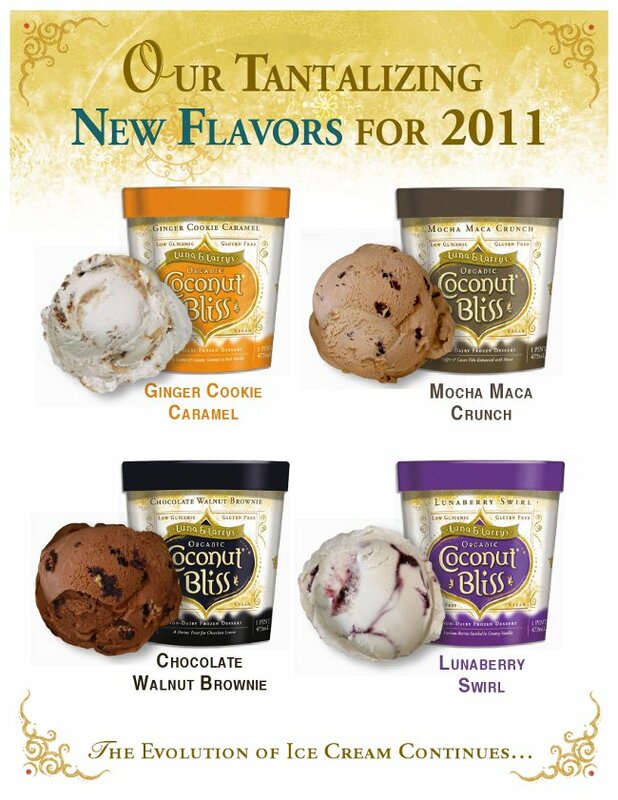 Take out your bowls and spoons and get ready to eat, ladies and gentlemen, because Coconut Bliss has just added four more amazing and innovative flavors to their already impressive lineup. The line of coconut milk-based non-dairy, vegan, and gluten-free ice cream already includes flavors such as Cappuccino, Mint Galactica, and Naked Coconut. The new flavors will be Ginger Cookie Caramel (featuring a caramel sauce, spicy ginger cookies and rice vanilla); Chocolate Walnut Brownie (this is made with brownies from Pamela's, a gluten-free brand, and heart-healthy walnuts); Mocha Maca Crunch (this contains coffee and cocoa nibs and pieces of the maca root); and Lunaberry Swirl (this is full of powerfully antioxidant berries such as wild blueberries, organic strawberries and organic blackberries). Staying true to their mission and philosophy, these new varieties will also be gluten-free, soy-free and cane sugar-free, and will feature a new sweetener, coconut sugar. "Introducing new flavors is big news for us because we only do so after a lot of testing in our home kitchen, months of testing with our tasting team, and when we are sure we have a winner," says Larry Kaplowitz, co-founder of Bliss Unlimited, LLC. "But we are doubly excited this time because of our new ingredient, coconut sugar, which, to our knowledge, no other ice cream maker is using." Their other flavors still contain agave nectar, but for those wishing to avoid it, these new flavors offer a great alternative, and, according to testers, the coconut sugar also adds a richer taste and more of a caramel flavor. Find out more information on the company's website, located here. UPDATE 4/7 3:17 p.m.: According to Kiley at Cocnut Bliss, "Our new flavors still contain agave as the sweetener in the base, we tried using coconut sugar and were not pleased with the results. Coconut sugar has a very distinct flavor that was not complimentary with the coconut milk base."